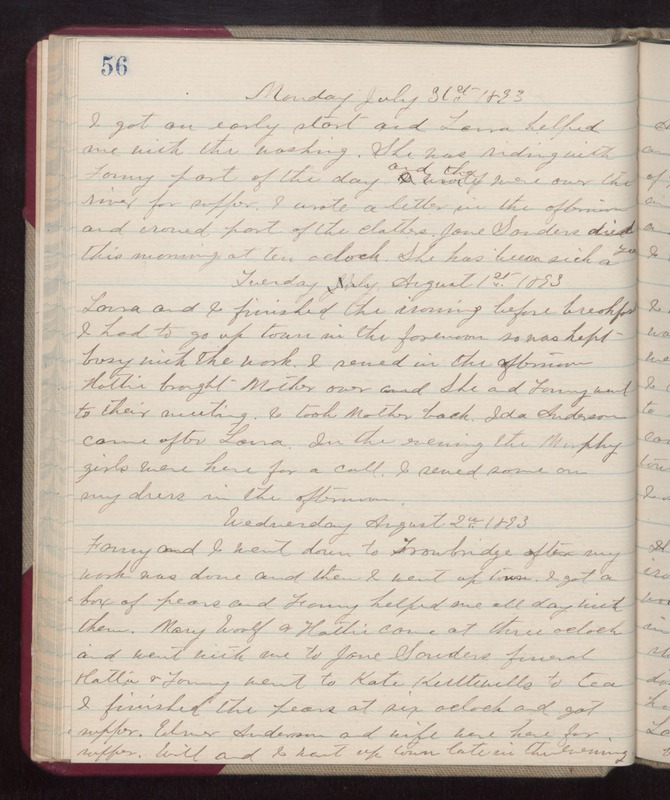 Monday July 31st 1893 I got an early start and Laura helped me with the washing. She was riding with Fanny part of the day and they were over the river for supper. I wrote a letter in the afternoon and ironed part of the clothes. Jane Sanders died this morning at ten oclock. She had been sick a year. Tuesday August 1st 1893 Laura and I finished the ironing before breakfast. I had to go up town in the forenoon so was kept busy with the work. I sewed in h the afternoon. Hattie brought Mother over and she and Fanny went to their meeting. I took Mother back. Ida Anderson came after Laura. In the evening the Murphy girls were here for a call. I sewed some on my dress in the afternoon. Wednesday August 2nd 1893 Fanny and I went down to Trowbridge after my work was done and then I went up town. I got a box of pears and Fanny helped me all day with them. Mary Woolf & Hattie came at three oclock and went with we to Jane Sanders funeral. Hattie & Fanny went to Kate Kuttlewells to tea. I finished the pears at six oclock and got supper. Elmer Anderson and wife were here for supper. Will and I went up town late in the evening.